According to the media articles, she's a single mom... but did they ever reference that in the actual show? I can't recall any instances or hints. Maybe that's why she's 'black'? Heart broken? According to the media articles, she's a single mom... but did they ever reference that in the actual show? I can't recall any instances or hints. Maybe that's why she's 'black'? In the show, she is just a quietly nun who has a ninja skilled (quick move and stealth in the dark) but be too much obsession with her cross which led her defeated to Acchan's gang. she's a single mom... but did they ever reference that in the actual show? Eh? Eh? Nani kore? Black-san work at konbini? But since you did does anyone know what that red book she carries is? At first I assumed it was a bible, but there was no reference to that however. There's a faintly colored gold title. But no scenes I've found where it's clear. Total guess. After trying to sharpen it. I think the start resembles Eco... so its an Ecology or Economy book? That's not fun! But hey, she was a 3rd year with a kid. Yeah, it's gonna be pretty hard to find out what it really was. 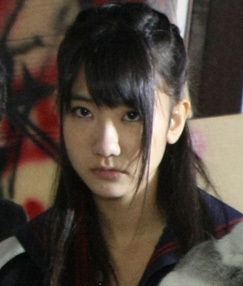 We should write on Yukirin's blog and ask if she remembers. There's also a scene in MG2 where I think Otabe picked up the book, but it's not clear either. I thought the first letter was a fancy L, and I assumed it was some book in French or something. Everyone agrees that... Black is a freaking VAMPIRE right? I mean, come on! That speed, that strength.